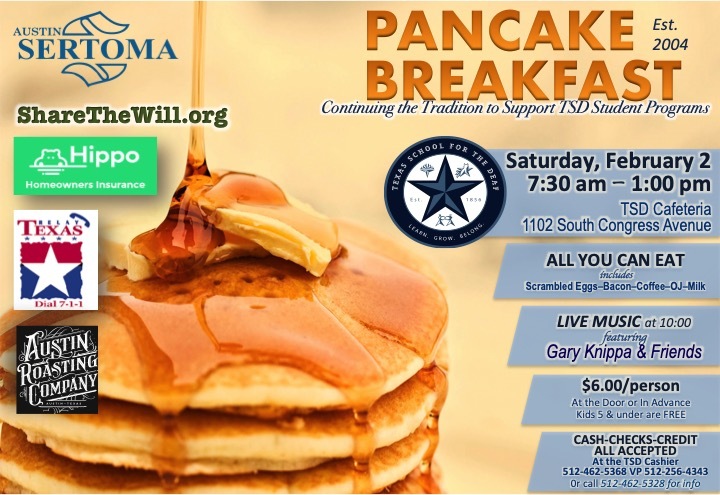 Time: 7:30 a.m. – 1:00 p.m.
MORE: To commemorate its’ longtime partnership, Texas School for the Deaf (TSD) honors the Austin Sertoma Club’s loyal support of TSD faculty and student programs. Proceeds will go to extend support for TSD scholarships and student/faculty programs Sertoma has long been passionate about. Live music with Gary Knippa & Friends 10:00 a.m. – 12:00 p.m.
Ballet Folklorico performance – 12:00 p.m. Sponsored by Share the Will Foundation, Hippo Insurance, Relay Texas, Austin Roasting Company, Labatt Foods, and with support from the Round Rock Community Foundation, Austin Jeep People, Hutto ROTC, and Sertoma clubs of Travis and Williamson counties. The Texas School for the Deaf is the oldest continuously operating public school in Texas. Educating deaf and hard of hearing students of Texas since 1856, the campus also provides outreach and educational resources for students, their families and professionals in the field throughout the state of Texas. With educational excellence and a strong belief in a culture and community at TSD, students form a unique identity based on their individual strengths and talents. TSD is an environment where students learn, grow, and belong. For more information about the Texas School for the Deaf, visit http://www.tsd.state.tx.us/.